What if we sold everything, bought a bus, and traveled? She answered with one word: YES. 2014 | We spent a year and a half downsizing, listing our house, and renovating our first Airstream. We had always known that we hoped for more in life, and felt very much like square pegs in round holes as we were checking off the boxes. House? Check. Two cars? Check. Jobs? Check. Yet our hearts weren't at rest. Making the decision to travel was (at the time) seen as crazy...and we ignored the cautious warnings of well-meaning friends and family and dove in headfirst. We couldn't be more grateful we did. 2015 | We hit the road as full-time travelers and spent six months traveling from South Dakota to Alaska, Montana to California. Our journey ended abruptly when family circumstances arose, and we returned to the Midwest and life in a city, and sold Louise. We were changed irrevocably by this time on the road, and though what we were facing was pretty damn impossible, we couldn't return to living a life that wasn't true. 2016 | We bought our second Airstream, June, after being back in a 9-to-5, sticks and bricks life for only six weeks. We hoped we could travel again someday, somehow. We were now nomads, though and through, and would spend another year and a half fighting tooth and nail to get back on the road. 2017 | We started The Modern Caravan as a blog and resource page, with the idea that one day we'd maybe offer renovations for clients. At the last minute, before launching the website, we added renovation, design, and consultation services. We were booked for two years within a few months of opening our doors, much to our surprise, and decided to travel to our renovations and live on site so we could get back on the road. 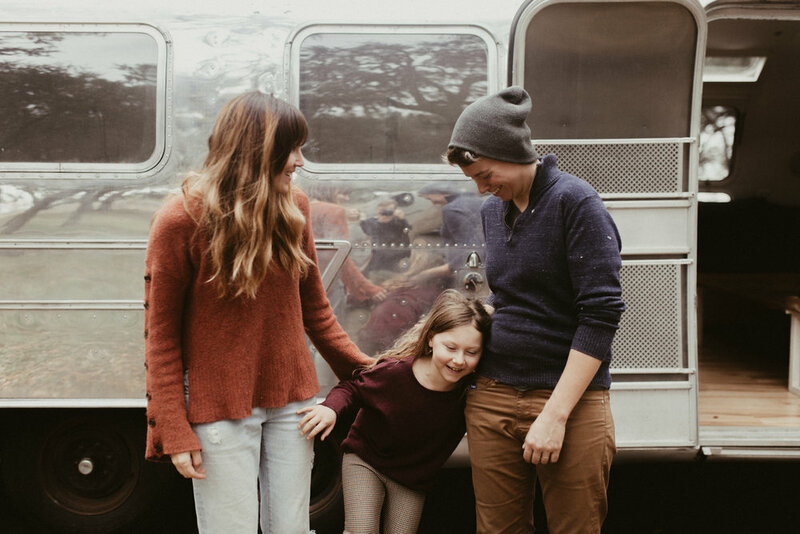 We did two client renovations (Isla and Luna), and upgraded to a larger Airstream (Hawk) for our growing family and business after selling June. 2018| At the end of this year and five years of renovating Airstreams, we are looking at our next. We don’t know what that may be quite yet, but we are ready and willing to be open to it. The Native Two | Nature, travel, community. The Long Long Airstream | Formerly Democratic Travelers, John & Laura have been on the road for four years and have renovated a stunning second Airstream. Vacilando Quilting | Modern textiles born on the road, inspired by travel and made to be well-loved. Tiny House, Tiny Footprint | Kathleen is sharing stories of those living small and inspiring others to reduce their environmental footprint + connect with nature. Tribe Wanderlust | Loving, Growing, Wandering | Creating our own definition of success. She Explores | A website and podcasts for inquisitive women in the outdoors, on the road, and besides. A Thousand Roads | Nomadic mother, writer, literary consultant. | Deep maps, new archetypes, finding the sun-gold. Life Without Waiting | All those things you've always wanted to do…you should go do them.